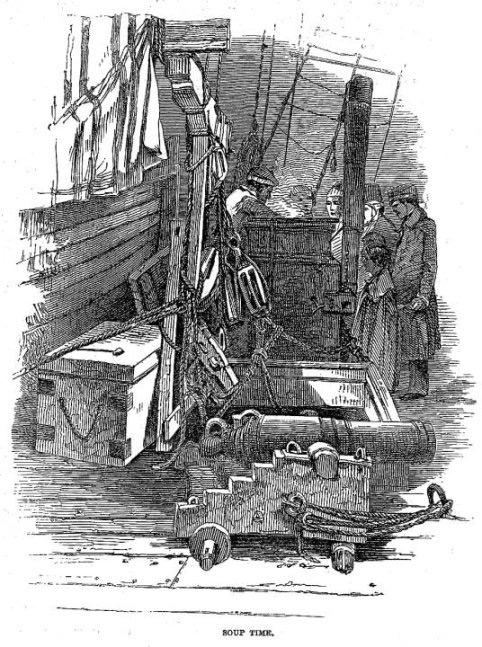 Most early migrants to Tasmania, whether convict, bounty or full fare, travelled to Australia in dumpy looking wooden ships with square sterns, which sailed badly and tended to ride like corks. If well maintained they were fairly safe but they were fire prone and many leaked badly, requiring constant pumping. 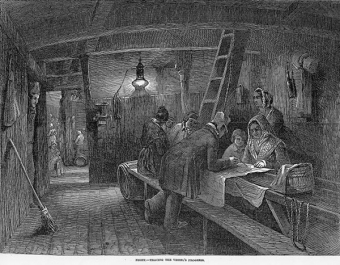 On board, convicts or bounty ‘emigrants’ who travelled steerage had to put up with overcrowded, dark, smelly, damp quarters which encouraged the spread of pests and diseases. During the Gold Rush sleek, fast clipper ships were introduced to satisfy a huge demand for speedy passenger vessels. They often used the shorter but much more exposed Great Circle route, deep in the Southern Ocean and through the roaring 40s. Although the voyage was cut by almost half and the vessels comfortably fitted out, passengers often experienced petrifying, rough passages. 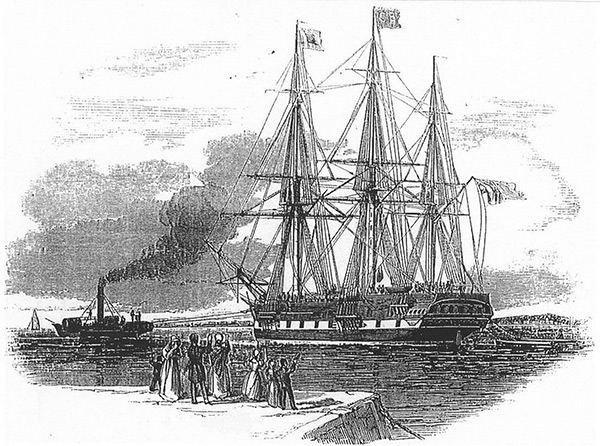 Gradually during the 1800s ships became much larger and sailing times shorter as wooden sailing ships were replaced by iron vessels with steam engines. Births and burials at sea were normal on emigrant ships. 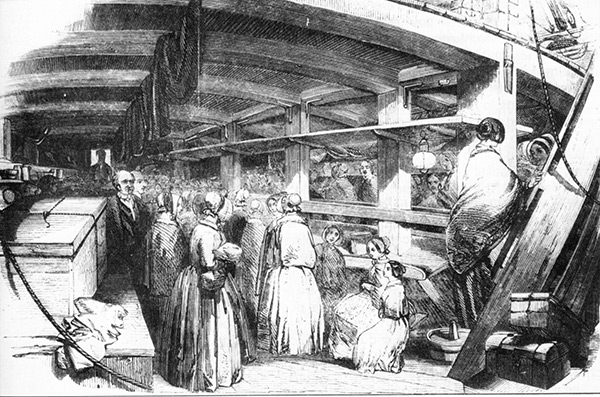 Cramped conditions, the poor general health of migrants and ignorance of good hygiene meant that infectious diseases often spread rapidly. 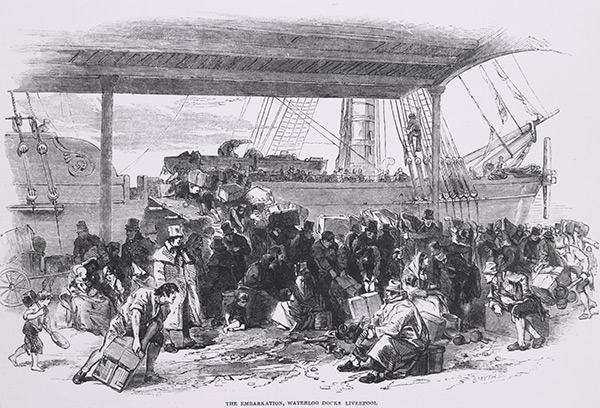 Emigrants on the 'Bussorah Merchant' which sailed from Ireland to Hobart in 1837 suffered particularly badly. 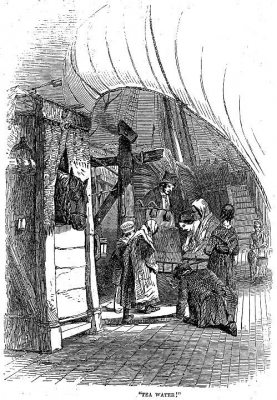 Four women and 64 out of 133 children died, most of measles and smallpox. 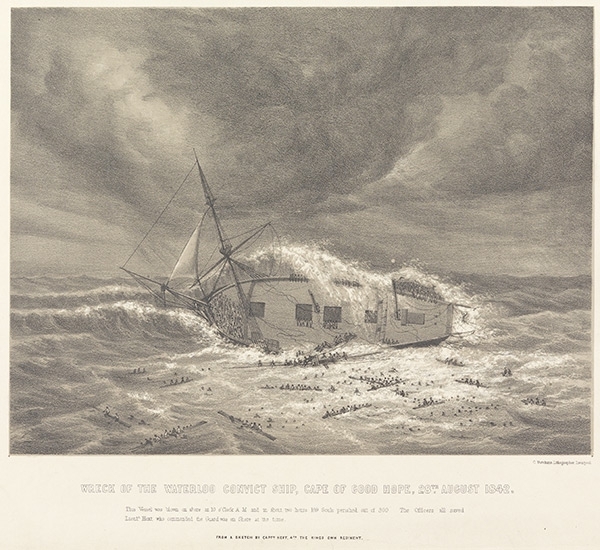 Wreck of the convict ship 'Waterloo' (1842). 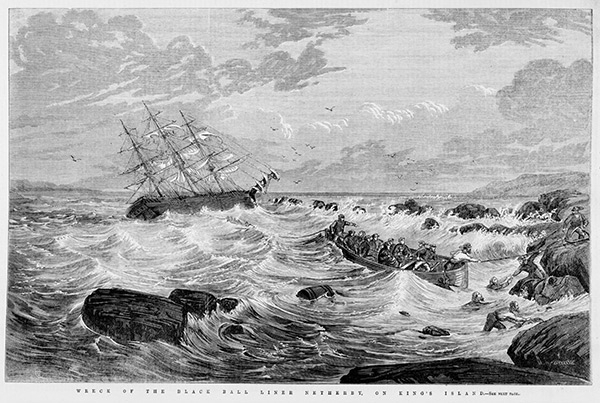 Surprisingly few convict ships were wrecked on the long voyage to Australia. One casualty was the 'Waterloo'. After an outbreak of scurvy she stopped at the Cape of Good Hope to obtain fresh food but a storm blew up and the anchors failed. The death toll included 143 male convicts, as well as crewmen, military guards and soldiers’ families. 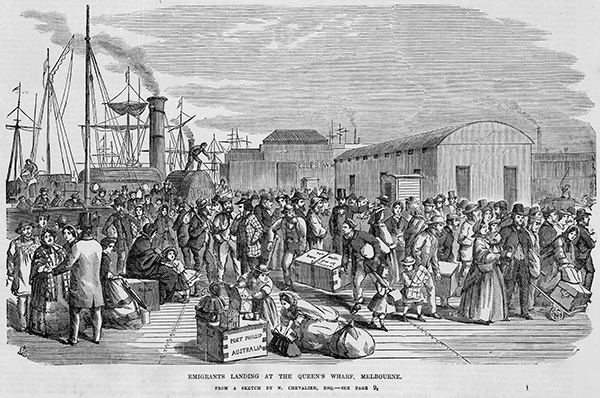 The 72 surviving convicts were sent on to Hobart. 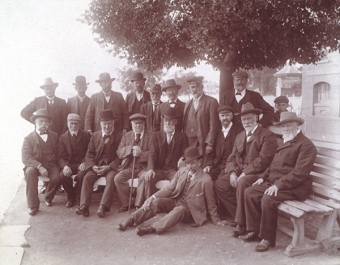 Tasmanian Archives and Heritage Office. 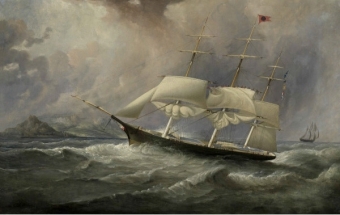 The 'Catariqui' was carrying assisted migrants to Port Philip when she ran into the rocky shore of King Island in 1845. Four hundred people drowned; only nine survived. When the clipper 'Netherby' ran into the island 25 years later she was carrying 452 assisted migrants to Queensland. Amazingly everyone survived including one addition – a baby born on the desolate shore. The 'Ocean Chief'. Australian National Maritime Museum. 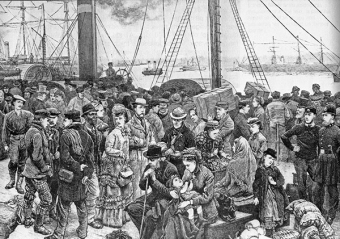 Fifty year reunion of emigrants on the 'Ocean Chief' 1905. 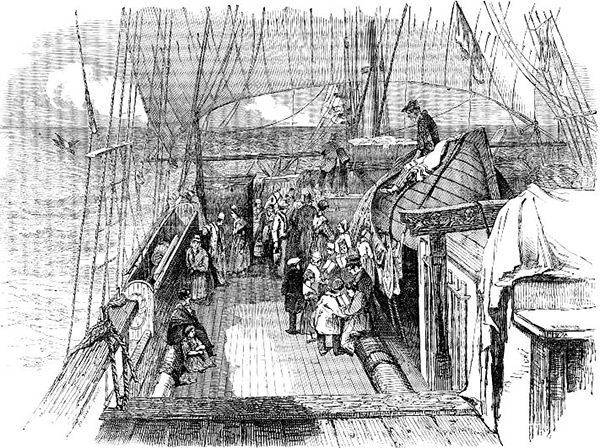 Although cramped conditions and lack of privacy could lead to conflict, many friendships were forged on emigrant ships. 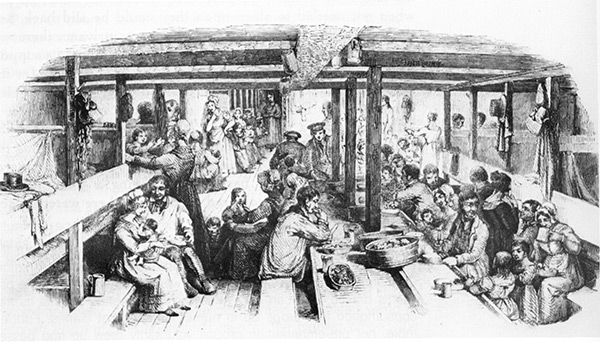 William Gibson organised regular reunions of fellow bounty migrants who arrived in Hobart on the Ocean Chief in 1855. 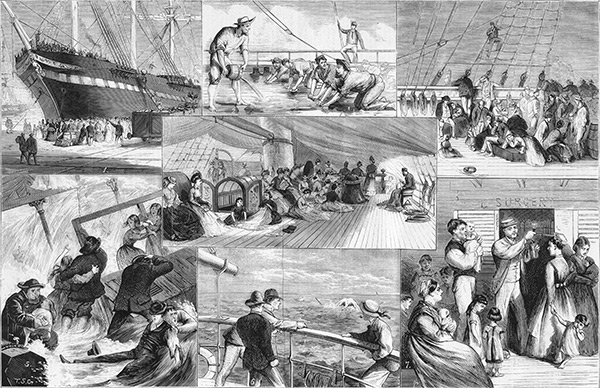 The journey took ‘but 72 days 7 hours from anchor to anchor’( a record at the time) and her 370 adult and 114 child passengers arrived in good health. Tasmanian Archives and Heritage Office. On board an emigrant ship 1875. State Library of Victoria.